All transactions are safe and secure with a reliable history in online purchasing behind each of our associates. 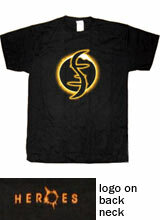 Buy the Heroes Helix Symbol t-shirt to own Heroes clothing and merchandise. The Heroes quote, "Save the cheerleader, save the world," is first heard in episode four of season one, and it quickly becomes the most recognizable catchphrase from the TV series. The two most familiar symbols from the series are the eclipse and the Heroes Helix symbol. The latter appears on the hilt of Hiro Nakamura's sword. Both symbols can be seen on this tee. Saving the cheerleader is a key factor in preventing the destruction of New York City. Look for the quote on the front of the Heroes Save the Cheerleader Save the World t-shirt below. In addition to the Heroes Helix Symbol tee above, browse the Heroes Clothing Gallery for more apparel like men's and women's clothes, kids shirts or hoodies.